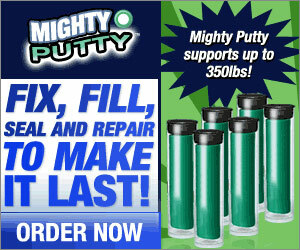 The Mighty Putty is a two-part epoxy putty stick that bonds, seals leaks and repairs gouges in steel, aluminum, wood, fiberglass, concrete and ceramics. Cures rock hard in minutes. Bonds well to wet surfaces. Can be painted, sanded, machined, tapped or drilled when fully cured up to 24 hours. You’ll find it useful for most repairs around the house! * Fills cracks in walls. * Strong enough to pull 80,000 lbs. * Ideal for crafts & knicknacks. For a limited time, buy 2 and get 4 free!